UCM’s Department of Music and the Performing Arts Series present classical guitarist Zane Forshee in concert Thursday, March 30, 7:30pm in Hart Recital Hall on the UCM campus. Described as “…one of his generation’s finest guitarists,” (Fingerstyle Guitar Magazine), Forshee is active both as a soloist and chamber musician. Recent concert engagements have taken him across North America, Europe, and Asia, where his live performances have been noted for possessing “a beautiful ever-flow that held the audience captivated” (Retriever Weekly). Raised in St. Louis, Zane’s exposure to various forms of music, both classical and popular, inspired his interest in developing diverse programs for the guitar. His broad musical range and openness to collaboration has led him to work with an array of distinct artists from Opus 1 Contemporary Dance Company to composers: David Revill, Luke Bedford, Gene Koshinski, and Benjamin Verdery. Zane holds a Doctor of Musical Arts Degree, Master of Music Degree, and Graduate Performance Diploma from the Peabody Conservatory of Music of the Johns Hopkins University, where he serves as the Chair of the Guitar and Harp Department. He also serves on the faculty of the University of Maryland, Baltimore County and is in residence at the Performing Arts Institute Summer Music Festival in Pennsylvania. Zane’s 3-day residency on campus includes masterclasses and seminars, culminating in the concert Thursday the 30th. Tickets for the concert will be available starting Monday, March 27, 9am-Noon at the Central Tickets Box Office, Administration 100, and one hour prior to showtime at the venue, or by calling 660-543-8888. 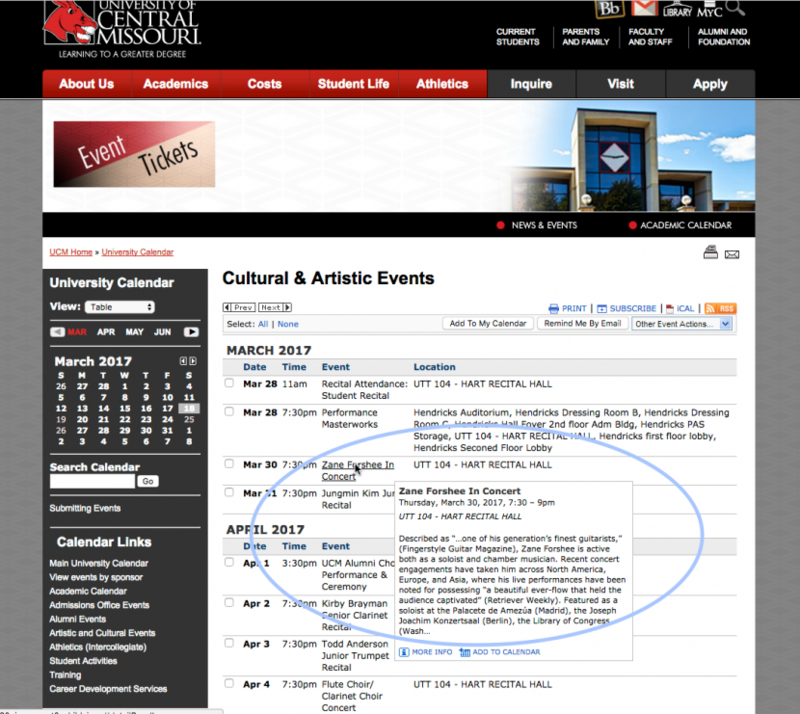 Tickets and information are available anytime online at ucmpas.com. Dr. Forshee’s 3-day residency is made possible in part by a grant from the Missouri Arts Council, a state agency.